Sydney DBS Neurosurgeon, Dr Raymond Cook, talks about his experience with Deep Brain Stimulation in Essential Tremor. This neurological disorder is characterised by the involuntary shaking or trembling of particular parts of the body, usually the head and hands. In this week’s video, Neurologist Dr Paul Silberstein talks about how he first became interested in the Deep Brain Stimulation procedure and what encouraged his interest in using DBS to help his patients. Sydney DBS will post a series of videos where Neurosurgeon Dr Raymond Cook & Neurologist Dr Paul Silberstein answer questions on Deep Brain Stimulation. The short and informative videos will be posted weekly and will feature Dr Cook & Dr Silberstein answering a variety of commonly asked questions around the history of DBS in Australia, the DBS procedure and what’s involved, conditions DBS treats, when and how our doctors became involved, and what happens after you’ve had DBS. These videos provide helpful information to a patient considering Deep Brain Stimulation for their Parkinson’s Disease, Dystonia, Essential Tremor or Tourette Syndrome. The first of our weekly videos features Neurosurgeon, Dr Raymond Cook, discussing the success rate of Deep Brain Stimulation for Parkinson’s Disease. Non-motor symptoms in Parkinson’s disease (PD) include depression, anxiety, sleep disorders, hallucinations/psychosis, cognitive dysfunction, apathy, dopamine dysregulation syndrome, impulse control disorders, and autonomic and gastrointestinal symptoms. Neuropsychiatric symptoms in PD can be due to the pathologic brain changes, due to the emotional reactions to the disease process, and due to treatment-related side effects. Depressive episodes or panic attacks precede the onset of motor symptoms in up to 30% of patients with PD (Santamaria Neurology 1986). As PD progresses, non-motor symptoms, rather than motor symptoms, are the main contributors to disability (Martinez-Martin et al, Movement Disorders, vol. 26, no. 3, 399–406, 2011). The good news is that neuropsychiatric symptoms in PD can be effectively managed, resulting in a clear improvement in quality of life. Better managing non-motor symptoms (eg. anxiety) can also improve motor function. Unfortunately, due to stigma, lack of awareness and other factors, many patients miss out on receiving optimal management for their neuropsychiatric symptoms. Treatment outcomes are improved if symptoms are identified promptly and evidence based treatment strategies are instituted early. Hence, it pays to be pro-active and to keep an eye out for these symptoms. A good approach is for you (and other key supports, such as your partner) to learn more about these non-motor symptoms in case they develop at a later stage. There are a number of good resources, but the DASH handbook is a good place to start: http://www.parkinsonsnsw.org.au/wp-content/uploads/2015/03/DASH_Booklet.pdf. If you do develop any of these very common neuropsychiatric symptoms, a good person to speak to in the first instance is your local doctor. Your local doctor will then co-ordinate your management. This commonly involves first seeking the input and specific skillset of a range of specialists, such as your neurologist, a psychiatrist, neuropsychiatrist or psychologist. A comprehensive management plan will then be tailored to your specific situation that addresses biological factors (e.g. reviewing your medication), psychological factors (e.g. a talking-based therapy), social and lifestyle factors. If we take the example of depression or anxiety in PD, your neurologist would assess the possibility that hypodopaminergic states (e.g. too low a dose of your PD medications) might be contributing to symptoms such as depression, anxiety and apathy. Mood and anxiety symptoms can be quite different in the ON and OFF medication state (particularly as PD becomes more advanced), so this is another thing that your doctor will assess. As well as PD being associated with the loss of dopamine producing neurons in the substantia nigra, it has been demonstrated that there can also be loss of noradrenergic neurons in the locus coeruleus and loss of serotonergic neurons in the raphe nucleus. These neurotransmitters both play an important role in the regulation of mood and anxiety. More marked degeneration in these regions has been demonstrated in PD patients with depression vs PD without depression (Ehgoetz et al. J Neurol Sci 2017). Hence, there may be a role for commencing an antidepressant medication, which, amongst other things, can increase the availability of serotonin. The need for such antidepressant medication would need to be assessed by your doctor, with specialist input for a psychiatrist or neuropsychiatrist often being helpful. Neuropsychiatry is a field of medicine that deals with the overlap between neurology and psychiatry. Major depressive episodes in PD occur alongside an anxiety disorder in 65% of patients (Ebmeier, Advances in Biological Psychiatry 2012). A number of psychological therapies have been shown to be effective in the management of both depression and anxiety. These evidence-based therapies include Cognitive Behavioural Therapy (CBT) and mindfulness-based cognitive therapies. These therapies can be delivered by either a psychologist or a psychiatrist, and your GP may refer you for such a talking-based therapy. The tools that you would learn to manage depression and anxiety will have enduring benefit. For managing the non-motor symptoms of PD, there is good evidence now for the role of exercise. Psychologically, this can also be quite empowering. For example, in can help patients feel that they are taking back some control in their life by potentially modifying the course and impact of PD. Hence, if it is physically possible (and after discussion with your doctors), it is helpful to set a goal for regular exercise and to incorporate this into a written plan for the week. There are a number of group-based, PD-specific, exercise programmes that you can talk with your doctor about. Finally, it is also worth considering learning some mindfulness meditation skills, which can be very useful for managing anxiety and the impact of PD on your life. There are now many apps that you can use to learn these skills. The Headspace app is quite a good one https://www.headspace.com/headspace-meditation-app. On 28 October, Sydney DBS doctors spoke at the Neuropsychiatry & Behavioural Neurology Conference at UNSW in Sydney. 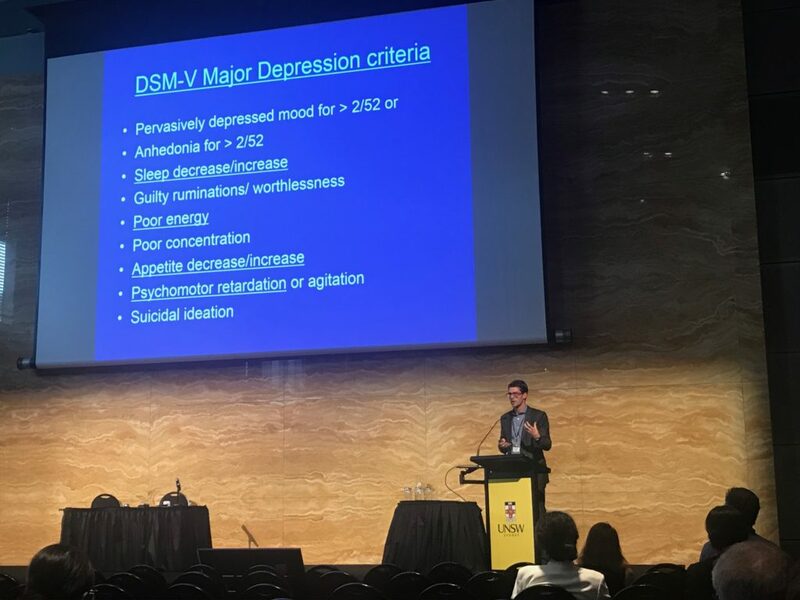 The event attracted a variety of keynote speakers from around Australia and themed sessions were held about specialist subjects such as brain stimulation, cognitive neuropsychiatry, Parkinson’s disease and neuroinflammation. The event is operated by The Royal Australian & New Zealand College of Psychiatrists and the theme for this year’s event was ‘Clinical Neuroscience Paradigms for 21st Century Practice’. 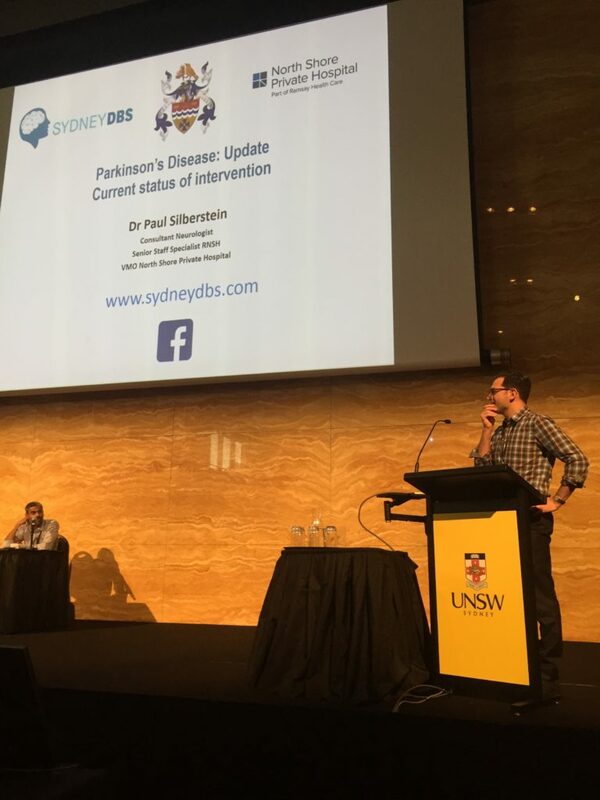 Sydney DBS Neurologist Dr Paul Silberstien gave the audience a Parkinson’s Disease update and current state of intervention and Neuropsychiatrist Dr Linton Meagher spoke about the neuropsychiatric considerations of Parkinson’s Disease. North Shore Private Hospital recently interviewed Visiting Medical Officer, Sydney DBS Neurologist Dr Paul Silberstein, and asked him how he got involved with Deep Brain Stimulation for Parkinson’s Disease and other movement disorders such as Dystonia, Tremor and Tourette Syndrome. I have been interested in Neurology ever since my days as a medical student. I always liked the problem solving aspect of Neurology. As a Registrar, Movement Disorders caught my attention. I appreciated the strong reliance on clinical acumen, but also the therapeutic aspects. In the late nineties, we already had excellent pharmaceuticals for managing Parkinson’s Disease (PD) and Botulinum Toxin was already well established for Dystonia. I was keen to pursue a Doctorate in Movement Disorders and was fortunate to be appointed to a Clinical Research Fellowship at the National Hospital for Neurology and Neurosurgery in London just as the Movement Disorder Surgery program was getting underway. I was astounded with the motor benefits the therapy could achieve in severely affected patients with PD, Dystonia and tremor disorders and have been committed to it ever since. About 75% of my practice is now related to Deep Brain Stimulation. What are the challenges in managing Parkinson’s Disease (PD) ? PD is such a complicated condition. The motor aspects have been written about for decades, but it is only in the last 20 years that we have appreciated the prevalence and importance of non-motor aspects such as anxiety and depression, constipation, pain and in later disease postural hypotension and cognitive impairment. We now know that non-motor symptoms, in particular Neuropsychiatric manifestations of PD have an even greater impact on quality of life than motor symptoms. Achieving patient engagement in management of non-motor symptoms, particularly neuropsychiatric symptoms can be a challenge, but is an integral part of good long term management. Deep Brain Stimulation relates to the implantation of a cerebral neurostimulator that can be employed in the management of patients with Parkinson’s Disease, tremor disorders, Dystonia and Tourette’s syndrome when satisfactory symptom control cannot be achieved with optimal medical therapy. Stimulating wires are implanted by a neurosurgical team in specific deep brain structures. These wires are routed under the skin to an implanted battery in the chest or abdominal wall. The battery produces a continuous impulse to the brain and provides 24-hour therapy to alleviate symptoms. Who might benefit from DBS? In Dystonia, tremor and Tourette’s syndrome, the main indication for surgery is failure to achieve satisfactory control with maximal medical therapy. Patients with idiopathic Parkinson’s disease usually achieve good symptom control with medical therapy for a period of years. Over time, symptom control can however become progressively inconsistent (motor fluctuations) and sometimes accompanied by periods of excessive movement (dyskinesia). Medication adjustments can be effective in the short to medium term in ironing out motor fluctuations and dyskinesia. With time however, some patients find that consistent symptom control can no longer be achieved. DBS can be very effective in re-establishing motor consistency in this instance. A small proportion of our work relates to patients with PD that have medication refractory tremor. These patients may opt to have surgery in the early years of their PD. Occasionally we also perform DBS on patients who are simply intolerant of all PD medications. This situation is uncommon but does occur. In Parkinson’s disease, DBS smooths motor fluctuations, reduces dyskinesias by ~75% and facilitates reduction in anti-PD medications by 50-75%. Essential tremor patients generally achieve 50-80% reduction in tremor. 50% of patients with Dystonia achieve >50 % reduction in Dystonia.